If you use a laptop, or you tend to shut down your computer when it’s not in use, then you’ve probably missed out on at least a few virus definitions updates from Microsoft Security Essentials (MSE). The problem lies in that MSE is designed only to update once every 24 hours, and if your computer is not powered on or is not connected to the internet at the time, it will just pass by. But, we can fix all of that by setting up a simple task rule in Windows; this works similar to the tutorial for fixing the Java update program. 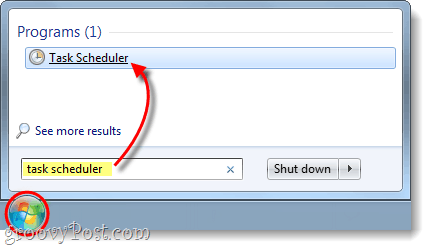 In the Start Menu, Search for task scheduler and Press Enter. 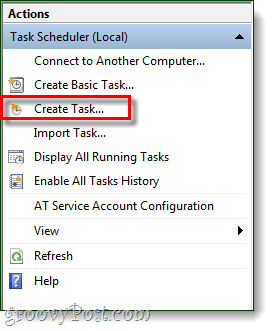 Do not confuse this step, Create Basic Task will not work the same. Name your task something relevant and give it a description. 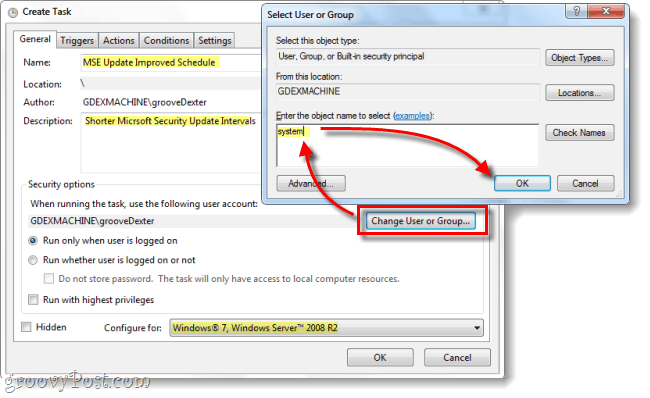 Now we need to change the user to SYSTEM, to do this Click Change User or Group… and then in the object name box Type system and Click OK. Once that is done, you can change the configuration to Windows 7 or whatever version of Windows you are using. Click the Triggers tab and from there Click New… The edit Trigger window should appear. You want to Begin the task on a schedule, set to Daily and Recur every one day. Once you have that go down to the Advanced settings are and set Repeat task every to 6 hours; to set this you’ll have to manually Type in 6 hours as the drop-menu doesn’t show it. Now set the duration to Indefinitely. 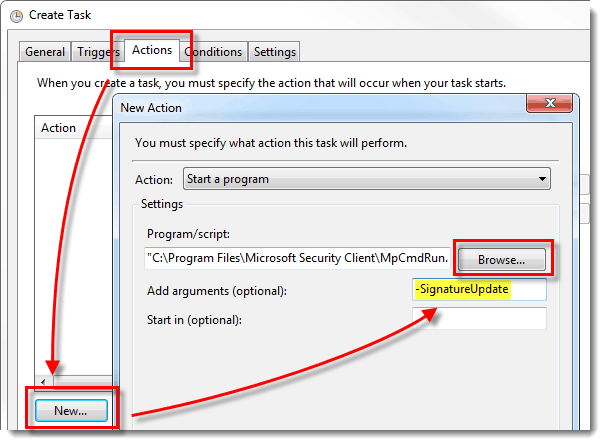 Make sure Enabled is checked and then Click OK.
Click the Actions tab and from there Click New… Here you want to Type –SignatureUpdate into the arguments box, and then Click Browse. Click the Conditions tab and Check the box under Network. For the network connection name use Any connection. 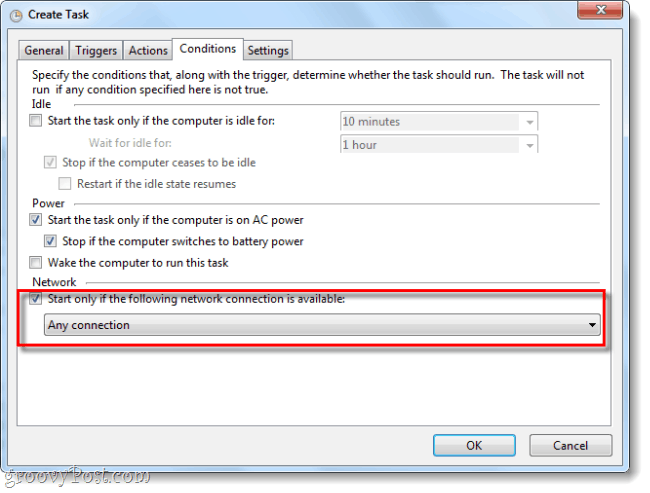 This will save your PC the trouble of disregarding the task if an internet connection is not available and makes sense because you cannot update MSE without the internet. At this point, the only thing left to do is Click OK to save the task. Your new schedule for Microsoft Security Essentials is setup, and you shouldn’t have any more problems with missing out on virus definition updates. Thanks for the instructions. 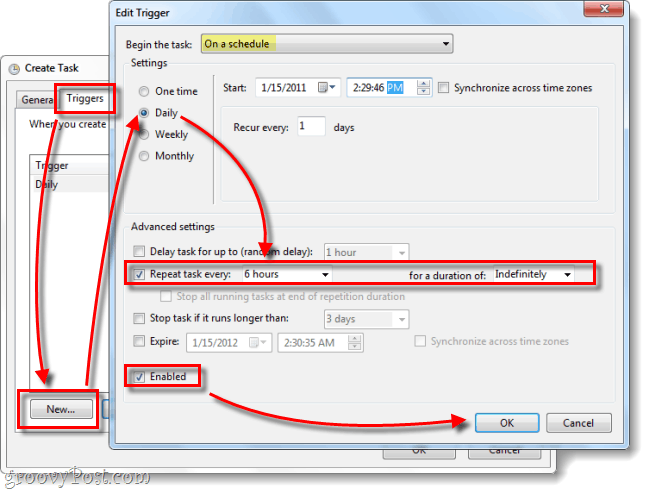 Just added this to my task scheduler! Have MSE on a few PCs at work, so many thanks for this post. Awesome! Glad it helped you out! Smart idea. However, running this task results in 0x2 for me. 0x2 seems to stand for The system cannot find the file specified. Do you have a solution for this? I’m running win7 x64. Error 0x2 usually occurs when there is a problem with the file path (location). It’s also an error specific to Task Scheduler. 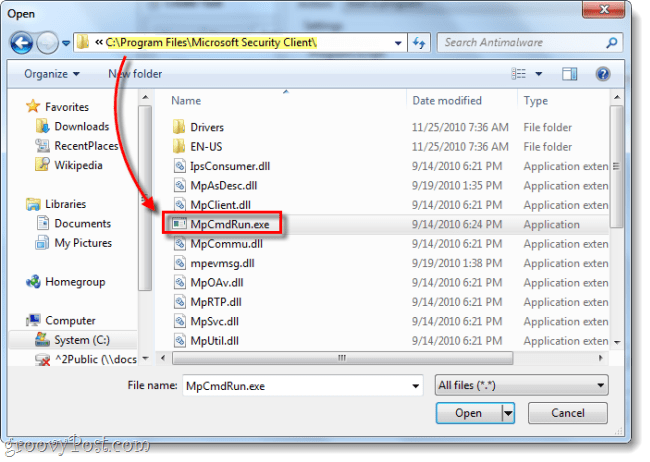 Did you use Browse to locate MpCmdRun.exe? It could be that yours is in the Program Files X86 folder. Will these instructions work on the NEW MSE upgrade that just came out…version 2.0.657.0?? Ok…I don’t think I changed anything but it now results in 0x0 (which is good). I do recommend to set the trigger time wisely. a set triggertime at 17.00h will be set to 23.00h because the computer is turned off at 17.00h. However at 23.00h the computer is turned off as well, so the next trigger will be 17.00h again wich bring us back to the beginning situation. My trigger time is now 20.30h, but you can also shorten the triggerinterval. I’m on my MacBook Air as I type this… (shh… don’t tell grooveDexter) so I can’t look however, doesn’t the Task Schedule give you the option to have the task run if it’s been missed? I’ll need to check this in the morning. Cool. Good idea! Just added the task! Thanks for the tip! I can use this for automation beyond MSE update. I disagree with the scheduling, you should use the “At logon” trigger with a 5 minute delay (to allow the system to settle). A problem with “At logon” occurs for people who seldom reboot their computers. Personally I often use my laptop and usually put it into sleep mode rather than shutting down, and I only restart the laptop every few days, sometimes even weekly. hence why you can run multiple triggers. in a resume from standby case, it would use the workstation unlock trigger. wow, great idea :) I’m going to try it out. that said, even when a computer is put into sleep, the user remains logged on so the repeat counter should continue after waking up. Is there any ways to locate the virus defination file in hard drive?? MySpace Is A Sinking Ship, Any Buyers?